With colorful pages and detailed information, Exploring Colorado Wineries – Guidebook & Journal will help you learn about each winery. Precise maps and written directions will assist you in getting there easily. While you taste and experience Colorado wines, write down your thoughts in the Notes section located on each winery’s page. When you are not tasting and want something else to do (or need to keep the kids happy! ), check out theWhat Else to See & Do section for each wine region. 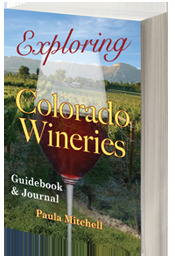 The complete and comprehensive Index makes Exploring Colorado Wineries – Guidebook & Journal easy to use.